Do you think the world needs to hear your music? Then #MusicPlusNextRated is the platform for you. It is a golden opportunity for upcoming artists to win cash prizes & priceless opportunities. Tag an upcoming artist. 1. 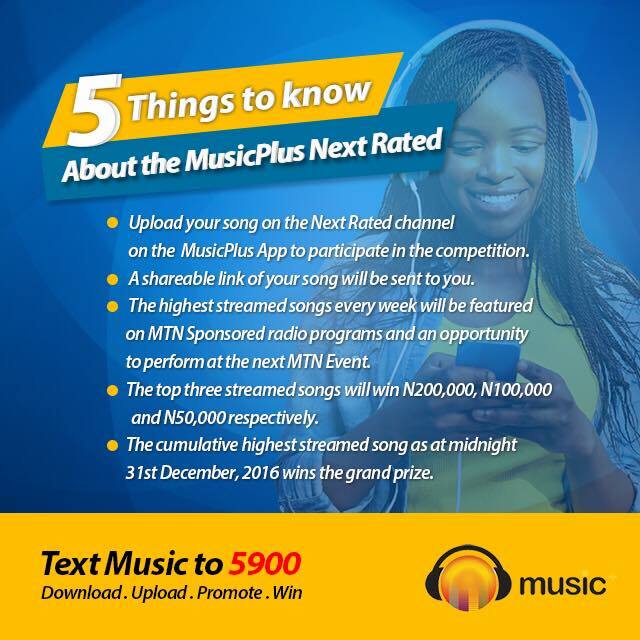 Upload your song on the Next Rated Channel on the Music Plus App to Participate in the contest. 2. A Shareable link of your song will be sent to you. 3. The Highest Streamed song every week will ne featured on Mtn Sponsored Radio programs and an Opportunity to perform at MTN Event. 5. The cumulative highest streamed song as at midnight 31st December 2016, wins the grand prize. Contest Ends on 31st December, 2016.
you can download free Message Ringtones and sms Ringtones here.